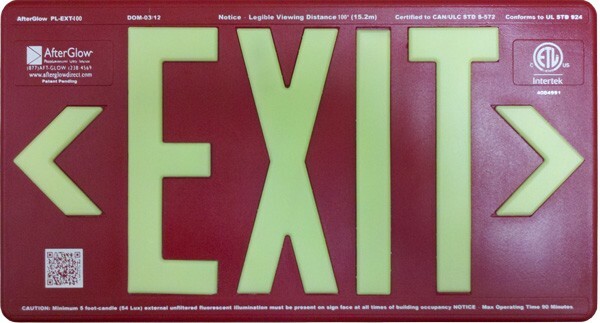 AfterGlow, LLC UL 924 EXIT sign, 100’ viewing distance, molded in red LEXAN® - 16” x 8-1/2” x 3/8”. UL-924 rated signs specifically tested for building compliance. The signs are approved for both high-level and low-level installation. These signs are rated for 50’, 75’, or 100' line-of-sight viewing distances. Photoluminescent EXIT signs reduce Green House Gases (GHG) since no electricity is needed. The signs are suitable for wall, flag or ceiling mounting. They do not use radioactive materials. They do not require bulb replacement or monthly/annual testing or maintenance. Properly selected and installed, these signs last for years and work even if damaged. An approved repair kit is available in the event they are vandalized. Approved for indoor/outdoor use.